Dr. Wintermark is an Assistant Professor of Radiology, Department of Radiology, Neuroradiology Section, University of California, San Francisco, CA. Dr. Fiebach is a Private Lecturer and a Specialist in Diagnostic Radiology, Institute for Diagnostic and Interventional Radiology and Neuroradiology, University Hospital of Essen, Germany. Kucinski and coworkers 11 presented clinical data from ischemic stroke pa-tients who were imaged with CT and DWI. They measured ADC and X-ray attenuation changes in infarcted tissue. In a cohort of 25 patients, they observed mean ADC changes of 170 × 10 -6 mm 2 /sec in the infarcted tissue 1.3 to 5.4 hours after symptom onset. This ADC decrease caused a strong contrast between infarcted and unaffected brain tissue (ADC 803 × 10 -6 mm 2 /sec) on DWI. In contrast to the ADC changes, Kucinski observed a time-dependent X-ray attenuation decrease of 0.4 HU per hour. Based on these data, CT appears to be less sensitive for early brain infarction as compared with DWI. 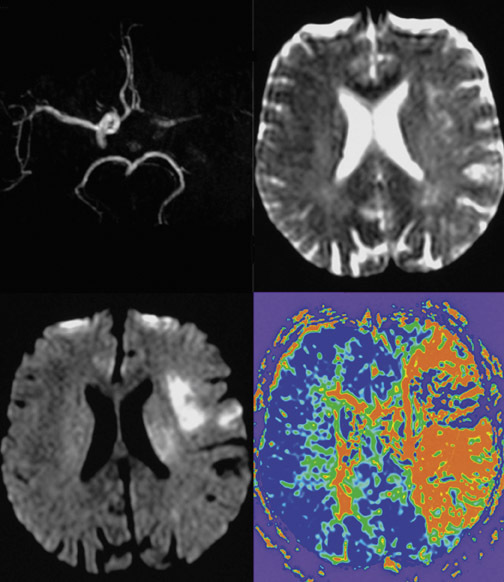 Perfusion-weighted imaging allows the measurement of capillary perfusion of the brain. The contrast bolus passage causes a nonlinear signal decrease in proportion to the perfused cerebral blood volume (CBV). It is not yet clear which PWI parameter gives the optimum approximation to critical hypoperfusion and allows the differentiation of infarct from penumbra and penumbra from oligemia. 16 In clinical practice, however, most authors agree that mean transit time (MTT) gives the best results. The calculation of the quantitative cerebral blood flow (CBF) requires knowledge of the arterial input function (AIF), which in clinical practice is estimated from a major artery, such as the middle cerebral artery (MCA) or internal carotid artery. Thijs et al 17 evaluated the impact of different AIFs measured at 4 different locations in 13 ischemic stroke patients. The curves of AIF were measured near both of the MCAs in MCA branches adjacent to the largest DWI abnormality and in the contralateral tissue to the lesion that is seen on DWI. The largest PWI lesion was measured based on the AIF of the unaffected MCA. The other 3 measurements of AIF led to an underestimation of the infarct size on follow-up images. Fiehler and coworkers 22 analyzed the frequency of ADC normalization in 68 acute stroke patients. They reported that 19.7% of their cohort had ADC normalization in >5 mL brain tissue. In those patients imaged within 3 hours after symptom onset, ADC normalization was seen in 35.5%, while it was 7.5% in patients imaged between 3 and 6 hours after onset. Apparent diffusion coefficient normalization was predominantly seen in the basal ganglia and white matter in patients with distally located vessel occlusions, and it was associated with a trend toward a better clinical outcome. 22 Thus, patients presenting with a PWI/DWI match with-in 3 hours after symptom onset might have salvageable tissue at risk and may benefit from fibrinolysis. However, it is still not known whether the absence of hyperintensities on follow-up T2W images indicates neuronal integrity in humans. DeLaPaz and coworkers 23 and Li and coworkers 24 observed neuronal damage in histologic examinations of tissue showing ADC normalization after reperfusion in a rat stroke model. Hyperacute stroke imaging demands the differentiation between ischemic stroke and intracranial hemorrhage (ICH), which is impossible by clinical means only. The diagnosis of ICH is still in the domain of CT. 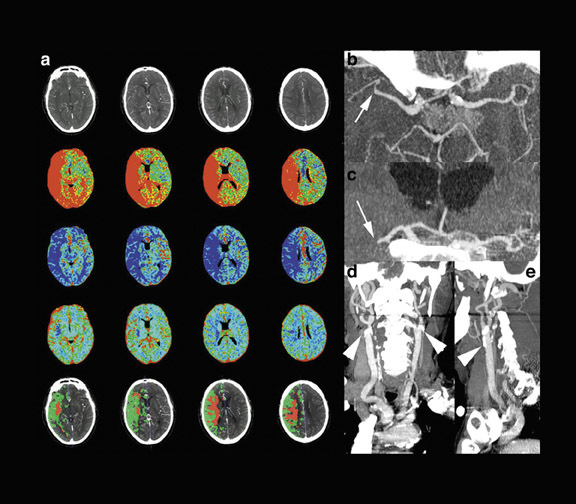 Performing both-CT for the exclusion of ICH and stroke MRI to guide therapeutic efforts-is time-consuming and medicoeconomically questionable. 27 The appearance of ICH at MRI primarily depends on the age of the hematoma and the type of MR contrast used. The key substrate for early MRI visualization of hemorrhage is deoxyhemoglobin, a blood degradation product with paramagnetic properties due to unpaired electrons. The typical appearance of ICH on MRI images is a heterogeneous focal lesion. With increasing susceptibility weighting, the central area of hypointensity became more pronounced. On T2*W images, no or few areas of hyperintensity are visible in the lesion's core, which is surrounded by a hypointense rim. There is a surrounding hyperintensity on T2W and T2*W images and a hypointensity on T1-weighted images that represent perifocal vasogenic edema. One randomized, blinded pro-spective multicenter trial recently investigated the role of stroke MRI in ICH. 28 Images from 62 ICH patients and 62 nonhemorrhagic stroke patients all acquired within the first 6 hours after symptom onset (mean 3 hours 18 minutes) were analyzed after randomization for the order of presentation. The size of ICH ranged from 1 to 101.5 mL (mean 17.3 mL). Three readers who were experienced in stroke imaging and 3 senior medical students each separately evaluated sets of DW, T2W, and T2*W images (all were unaware of the clinical details). The experienced readers identified ICH with a 100% sensitivity (confidence interval: 97.1% to 100%) and a 100% overall accuracy. The medical students achieved a mean sensitivity of 95.16% (90.32% to 98.39%). Thus, hyperacute ICH is detectable with excellent accuracy even if the raters have only limited experience. 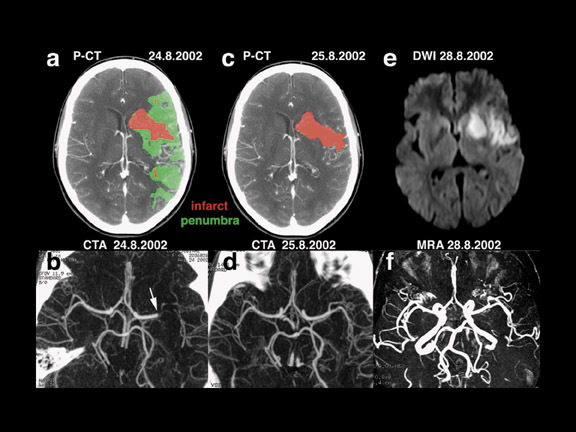 By combining MTT and rCBV results, PCT has the ability to reliably identify the ischemic reversible penumbra and the irretrievable infarct core in acute stroke patients, immediately on admission. In the infarct core, both MTT and rCBV values are lowered, whereas in the penumbra, cerebral vascular autoregulation attempts to compensate for decreased rCBF by a local vasodilatation, which results in increased rCBV values. 39,40 Commercial PCT software currently offers the real-time automatic calculation of infarct and penumbra maps according to the above-mentioned principles. PCT/CTA or MRI: Which one to choose? CT and MRI provide similar information. The DWI lesion corresponds to the infarct core, whereas the DWI/PWI mismatch is representative of the ischemic penumbra. 41 The infarct core and the ischemic penumbra, as exhibited by DWI/PWI and by PCT, respectively, are comparable (Figure 4). 39,40 Similarly, CTA and MRA results are very much alike (Figure 3). Besides the similarity of their results, both CT and MRI techniques show respective advantages and drawbacks to be considered in the special settings of acute stroke. Stroke MRI is still available only in a limited number of hospitals. Despite the advantages of stroke MRI, there are still doubts whether it is a safe approach in severely affected patients and, depending on each individual setting, it is hard to conduct stroke MRI without losing too much time before the onset of treatment. The main advantages are, first, direct visualization on DWI of the full extent of infarction and, second, whole-brain coverage that can be achieved with PWI at a time resolution of 1.4 seconds per frame; thus, even small but clinically relevant hypoperfusion can be visualized. Visualization of the circle of Willis can be performed within 3 minutes with a time-of-flight MRA. If a patient moves his or her head during image acquisition, a sequence can be easily repeated. No additional X-ray dosage or iodinated contrast agent is needed, and, therefore, no nephrotoxicity or relevant allergic reactions are expected. In contrast to iodinated contrast media, MRI perfusion measurement does not cause a feeling of heat, and, therefore, movement artifacts are less likely during perfusion imaging. However, the control of vital signs and the access to the patient during the 10-minute scan procedure is limited by the magnet. In addition, it takes some effort to train staff and technicians to conduct stroke MRI in a short period of time and to establish an adequate workflow during the hyperacute phase of ischemic stroke. The low requirements for performing PCT/CTA technology and its wide availability are keys to its taking over MRI in the imaging of acute stroke patients. Indeed, because of their relatively low cost and utility in other areas of medicine-particularly emergency medicine and trauma-CT scanners are becoming very widely available. In contrast to MRI, it is foreseeable that every major emergency center will eventually be able to complete this form of imaging within minutes of the patient presenting to the emergency department. Another major advantage of PCT over MRI relates to its quantitative accuracy, whereas MRI perfusion imaging offers only semiquantitative comparison of one hemisphere with the other. The quantitative accuracy of PCT makes it a potential surrogate marker to monitor the efficiency of acute reperfusion therapy, which is a decisive element when it comes to finding and validating new individualized therapeutic strategies for acute stroke patients. 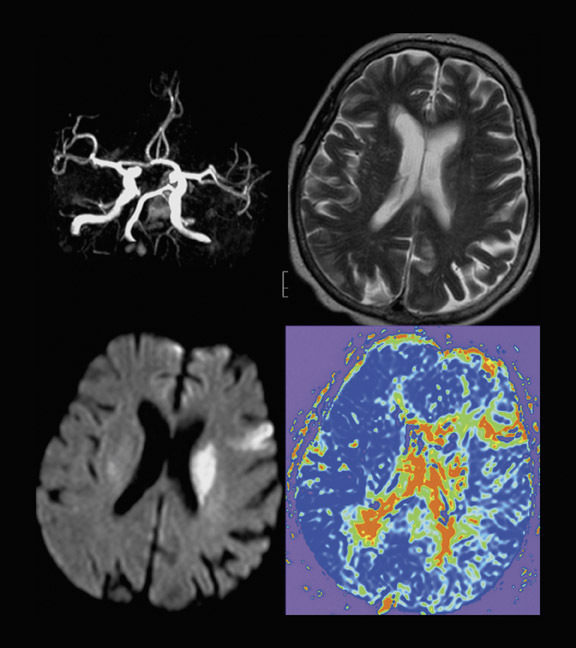 Both CT and MRI fulfill all the requirements for hyperacute stroke imaging. CT angiography and MRA can define the occlusion site, depict arterial dissection, grade collateral blood flow, and characterize atherosclerotic disease. Perfusion CT and DWI/PWI accurately delineate the infarct core and the ischemic penumbra. CT and MRI both have their own advantages and drawbacks. The selection of one technique over another depends on the intrinsic characteristics of each imaging technique but also on the settings and on the knowledge and experience of the institution's staff. Controversies regarding the superiority of either CT or MRI for acute stroke imaging should not obscure the ultimate goal, which is to increase the availability and improve the efficiency of thrombolytic therapy. From that standpoint, CT and MRI must be considered to be equivalent tools. It is hoped that the use of CT and/or MRI to define new individualized strategies for acute reperfusion will allow the number of acute stroke patients benefiting from thrombolytic therapy to be significantly increased. Imaging of brain parenchyma in stroke. Appl Radiol.